Welcome to the first SMC post of 2014. Last Saturday was the first Saturday of the year, but I was too busy enjoying my birthday to do anything else. 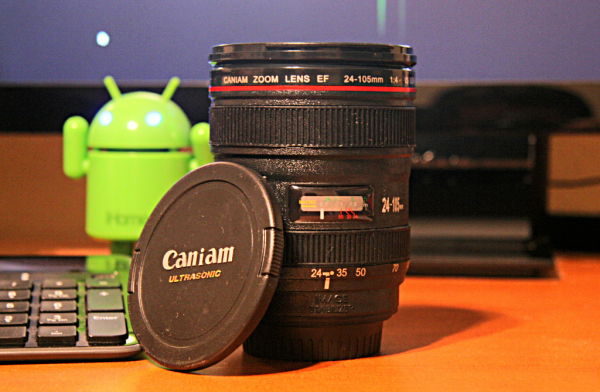 Which brings us to the new coffee mug below. I received it as a birthday gift from my brother Robert and his wife, Kim. Thanks guys! Frozen was #1 at the box office last weekend. The movie has some real staying power as it managed to jump back up into the number one spot in its sixth weekend. Impressive. To date Frozen has done over $300 million at the box office in the U.S. to go with its nearly $350 million outside the U.S. Not too shabby. An average 8-ouce cup of coffee contains between 95 and 200 milligrams of caffeine. It’s not enough. Just sayin’. Looks like my part time job in the hospital has come to an end. The facility I’m working for has finally found a full time IT pharmacist to fill the year-old vacancy. Sorry to lose the gig, but I learned a few new things and had some fun. I managed to complete their lagging NEPS implementation; hammered out a “database sync” issue they had between their pharmacy system, their inventory management system, and Pyxis; helped test their new pharmacy system upgrade prior to going live; and worked on bits and pieces of a new DoseEdge implementation that’s still in progress. Not bad. Time to find something else. Much of the east was hammered with freezing temperatures this week. 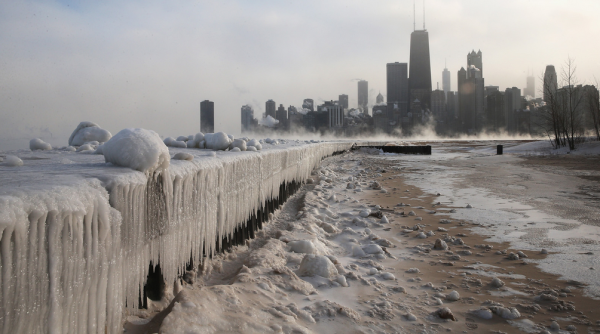 Chicago dipped to -16 degree Fahreheit. While these are terrible conditions to be out in, Mother Nature created some awesome scenes that were caught on film. You can find several images at Gizmodo, but I put my favorite below. Crazy! As someone commented when I posted this on Facebook, “reminds me of the movie Day After Tomorrow”. Sure does. Just a heads up, this post is CES 2014 heavy. There was just too much going on for it to be ignored. I love all the computer stuff, i.e ultrabooks, tablets, phones, etc. You’ve been warned. Wearables have been a hot topic, but if the volume of devices that appeared at CES is any indication of what’s to come we’ll be drowning in everything from headbands and goggles to smart socks in 2014. I’ve decided that I’m going to give some of these devices a shot. I’ll let you know how it goes. It should be an interesting year. 5 Ways Wearable Technology Will Impact Healthcare: “Wearable technology can revolutionize how doctors and patients share information, interact, and make decisions about patient healthcare. Patients can have greater access to data about their own bodies and be more involved in their overall health and wellness. …These devices have the potential to bring some incredibly positive changes to the healthcare industry, and the best is yet to come.” – Yep. Naked Security: “The makers of a new app, “NameTag,” say that their facial-recognition software is actually supposed to make the world a much more connected place, but given that the app can spot a face and wirelessly match it up to social media profiles, all without giving people the option to opt out, let’s go with stalker-friendly.” – That’s cool use of technology, but it’s downright creepy as well. I’ve been playing with cloud storage again. I just can’t help myself. I caught wind of a new service called Copy that was offering a free 15 GBs worth of storage for signing up, which I did. The reviews of the service have been pretty good so far. People are comparing it to Dropbox. I think Dropbox is one of the best in the business, so Copy should feel good about that comparison. It’s too early in my testing to say much, but so far it’s pretty slick. You can get 5 GB of extra storage if you sign up using a referral code, which would give you a total of 20 GB of storage for free. That’s pretty cool. You’re welcome to use mine if you like, just click here. PC Mag has a great article on The Best Cloud Storage Solutions. The article has a handy little chart that gives you quick access to important data like storage space and cost. A quick note about the services listed: take the authors opinion with a grain of salt. The article says that SugarSync is “by far one of the most intuitive of all the file-syncing services out there”. I recently dropped my paid subscription to SugarSync because I found the updated version to be a mess. I’ve been an Ultrabook fan for a while, and the X1 Carbon has always been on my short list of desirable machines. Lenovo updated the X1 Carbon for CES 2014, moving it from my list of desirables to my list of must-haves. The new X1 Carbon is super thin, incredibly light, has an updated IPS display, and new 4th generation Haswell processor to improve its performance and battery life. Smokin’! Communications of the ACM, Vol. 57 No. 1, Touchless Interactions in Surgery [full text article]: “One enabler of this growth [in touchless control of medical images] is the Kinect sensor and software development kit, which has lowered barriers to entry, including financial cost, development complexity, and need to wear trackable markers. The Kinect sensor is based on a laser and horizontally displaced infrared (IR) camera. The laser projects a known pattern onto the scene. The depth of each point in the scene is estimated by analyzing the way the pattern deforms when viewed from the Kinect’s IR camera. …Kinect has helped overcome some of the inherent challenges of full-depth skeleton capture with purely camera-based systems. With this range of systems, common themes have emerged, along with opportunity to explore a more diverse set of approaches to this particular problem area of touchless interaction during surgery. The concern is no longer to demonstrate the technical feasibility of such solutions but how to best design and implement touchless systems to work within the particular demands and circumstances that characterize practices in the operating theatre.” – Very interesting stuff when you realize just how far this technology has come. The use cases for such technology are quite compelling. Handsfree takes on an entirely new meaning. I’ve decided that I’m going to drop a few pounds this year, which is easier said than done. For those of you that don’t know, I was a stout 300+ pounds just a few years ago. I completely changed the way I ate, changed the way I exercised, and lost nearly 100 pounds over the course of a year. All good, but I got sloppy in 2012 and 2013, and now it’s time to get back on the right track. And what’s the toughest part of losing weight? Controlling what you eat: “If you want to change the way you look, you need to change the way you cook”. And here to help me is The Ultimate Guide to Eating Healthier in 2014 by Greatist.com. There are some good tips in there. The key for me was portion control. Maybe I should start another blog and track my weight loss, exercise and use of wearables. Nah, too much work. jasonkincaid.net: “To say this post pains me would be an understatement. More than any other technology, Evernote is part of me, having evolved from habit to instinct over several years and nearly seven thousand notes. Every day ideas flit through my head, ideas for essays, for characters, for jokes. …Because I use it so often, I am unusually familiar with the service’s warts. Evernote’s applications are glitchy to the extreme; they often feel as if they’re held together by the engineering equivalent of duct tape. Browser extensions crash, text cursors leap haphazardly across the screen — Most issues are benign enough, but the apps are so laden with quirks that I’ve long held a deep-seated fear that perhaps some of my data has not been saved, that through a syncing error, an accidental overwrite — some of these ideas have been forgotten.” – I am a heavy Evernote user. Unfortunately I’ve noticed a disturbing trend of syncing errors, the app not responding, and random glitchiness over the past few months. I’m concerned for the data that I have sitting in this once awesome application. Does anyone have any recommendations on how to not only extract my information, but where I can put it so that it’s still useful? Anyone? BrowneKnows: “Helpouts may be Google’s answer to affordable telemedicine. Google Helpouts were unveiled mid November as a secure platform for experts to offer advice through private hangouts while charging a per-minute fee for such services. There is still skepticism about how secure this new service is, but a few innovative physicians have started participating. Dr. Rodney Samaan is a preventive cardiologist in Los Angeles and an early adopter of Google+ Helpouts. For $3 per minute, Dr. Samaan offers online medical advice and case reviews as one of Google’s Helpout experts. Dr. Brian Pollak also gives healthcare advice, mostly related to patient care coordination, through Helpouts — and he does it for free!” – Great opportunity for outreach to patients that may not be able to make their way in to a traditional healthcare setting, i.e. a doctors office. I can see great pharmacy potential with Helpouts. The NFL Playoffs continue this weekend. I had a terrible NFL weekend last week. My picks were a complete disaster. What the heck were the Chiefs doing! How can an NFL team let a 28 point lead slip through their fingers. Amazing. This week we’ve got the Saints at Seahawks, Colts at Patriots, 49ers at Panthers and Chargers at Broncos. I’m taking the Seahawks, Colts (I hate the Patriots), Panthers and Broncos. And I’ll leave you with this…. Thanks for the link to Copy. I’ve signed up and it’s nice to know it’s run by Barracuda networks. Also, a replacement for Evernote. That’s a real problem. I have a bunch of my brain stored out there and we have shared data between the two of us. I hope they can get things stabilized. This is a prime opportunity for someone to write an app using the new DropBox Datastore API (https://www.dropbox.com/developers/datastore) to replace Evernote. It’s a big hill to climb, but things exist that could allow it to happen. I wonder if Copy is going to offer an API that allows for more than file storage, similar to the new DropBox API. Yeah, the Evernote thing is going to be an issue. I have more than 3000 personal notes plus another 4000 shared notebooks/notes sitting in Evernote. I’v starting to worry. I thought about using Google Keep, but it doesn’t have the same level of functionality, plus I’m worried about its staying power following the Google Reader shutdown. Copy looks pretty cool, and you just can’t beat the 15-20 GB of free storage. I love Dropbox, but the 5 GB of free storage is pretty limited by today’s standards and it’s very expensive to buy additional storage; compared to Amazon, SkyDrive, and Box that is.